Meeting quotas, reducing costs, balancing budgets — whatever the objective to be reached, deceitful bosses move with a one-track mind. Reach the goal, no matter what it takes. 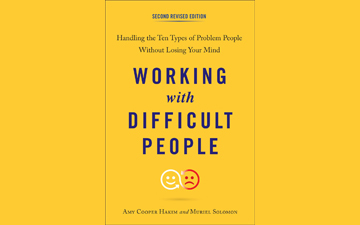 So begins one practical example in Working with Difficult People, by Amy Cooper Hakim and Muriel Solomon, an indispensable guide to keeping one’s sanity in dysfunctional workplaces. This second, revised edition has been updated to reflect contemporary issues including technology, generation gaps and language barriers. Each part of Working with Difficult People is then subdivided into three subsections: your boss, your colleagues, your subordinates. Each subsection is then further divided into describing the person’s behaviour, what they are thinking, what you in turn are thinking and a practical strategy and objective in working with that person. Working with Difficult People is truly a remarkable book. Its clarity can provide the solace through its solutions to the daily dilemmas of a stressful workplace. It can help you take control of dysfunctional situations in a practical manner instead of through avoidance, confrontation or resignation. Better yet, it may save you from reaching for that extra glass of wine or bag of chips at night. And it may get you a good night’s sleep.